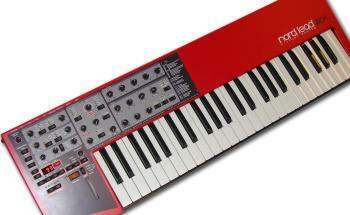 The original Nord Lead and Nord Lead 2 are among the most popular synthesizers ever built and used in the studio, on stage and on record by the many artists. With the model 2X Clavia kept the sound, improved the concept and upgraded the hardware. The Nord Lead 2X comes with 20 voice polyphony which is very useful when creating layered sounds and also very beneficial in sequencing situations when you use more than one sound at a time. Clavia also has extended the instrument's internal memory holding 4 x 99 user programs, 100 user performances and 4 x 10 user percussion kits plus 6 x 99 factory programs and 3 x 100 factory performances. The Nord Lead 2X is fully patch compatible with the Nord Lead 2 which means that you can transfer sounds directly between the models via MIDI. The awesome sound in the Nord Lead 2X is refined with brand new 24-bit DACs running at 96kHz.